The Qingdao Eurasian Economic and Trade Cooperation Industrial Park has thrust Jiaozhou into a more important role in the Belt and Road Initiative and among member countries of the Shanghai Cooperation Organization, according to local officials. The first phase of the industrial park covers an area of 8.28 square kilometers and is located in the Jiaozhou Economic and Technological Development Zone, a State-level development zone in the city. The industrial park has applied to establish the Economic and Trade Cooperation Demonstration Zone of Shanghai Cooperation Organization, which has been received positively by the Ministry of Commerce. Zhu Nini, chief of the administrative approval section of the Jiaozhou Bureau of Commerce, said: "The industrial park will have access to cooperate with Central Asia, South Asia and SCO countries in terms of bidirectional investment, trade logistics, port transportation, international capacity and development area cross-border cooperation." In fact, the industrial park has accumulated rich experience in foreign trade with the countries involved in the Belt and Road Initiative already, Zhu added. Relying on the Port of Qingdao and the Qingdao center for CRIntermodal rail container logistics, the industrial park has strong commercial exchanges with the countries along the Silk Road Economic Belt and 21st Century Maritime Silk Road. The center, one of 18 terminals operated by CRIntermodal, is located at Jiaozhou. With a total investment of 525 million yuan ($81.89 million), the logistics center is capable of handling 1.18 million twenty-foot equivalent units annually. 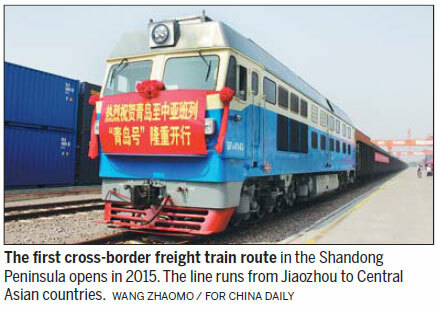 "The logistics center offers five international train services, connecting Northeast Asia with Europe, fostering Jiaozhou to go ahead in developing the Silk Road Economic Belt," said Zhang Zhaoyu, manager of the marketing department of the Qingdao center for CRIntermodal rail container logistics. Servicing international trains, the logistics center handled 980,000 TEU from 2015 to 2017, witnessing an increase of 786.7 percent when compared with the previous three years. "The Qingdao Eurasian Economic and Trade Cooperation Industrial Park has also gained plenty of achievements in attracting foreign projects and assisting Chinese enterprises in going global," Zhu said. To date, 33 key projects have settled in the industrial park with a combined investment totaling 41.8 billion yuan. The industrial park has a good cooperative relationship with SCO countries, such as Russia and Kazakhstan, according to Zhu. By establishing overseas industrial parks, the Qingdao Eurasian Economic and Trade Cooperation Industrial Park is helping qualified Chinese enterprises go global, including Haier and Hisense, she added.